This page concerns research from 2013. A more recent update on UK broadband speeds is available here. Ofcom's latest report into fixed-line residential broadband speeds shows that the average actual UK speed has risen by a third (3.1Mbit/s or 34%) in the six months from May to November 2012, as take-up of 'superfast' services increased. The report also shows that the average broadband speed has more than trebled in the last four years, from 3.6Mbit/s in November 2008 to its current level of 12.0Mbit/s (an increase of 234%). Consumers' continuing migration to higher-speed broadband packages is helping to drive the increase in actual UK average speeds2. By November 2012, more than three quarters (77%) of UK fixed-line residential broadband users were on packages with advertised speeds above 'up to' 10Mbit/s, up from 58% a year earlier. The proportion of broadband connections classed as 'superfast' (those with an advertised speed of 'up to' 30Mbit/s or above) is also on the increase. By November 2012, 13% of residential broadband connections were superfast, more than doubling from 5% in November 2011. Ed Richards, Ofcom Chief Executive, said: "Our research shows that UK consumers are adopting faster broadband packages to cater for their increasing use of bandwidth-heavy services such as video streaming. The increase in the average number of connected devices in UK homes is also driving the need for speed. "Internet providers are working to meet consumer demand through network upgrades and the launch of superfast packages, giving consumers faster speeds and greater choice." The research shows that residential superfast broadband connections are getting faster, with average speeds increasing from 35.8Mbit/s in May 2012, to 44.6Mbit/s in November 2012 (an increase of 8.8Mbit/s or 25%). The increase during this six-month period was primarily driven by growth in take-up of 'up to' 76Mbit/s fibre-to-the-cabinet (FTTC) services and Virgin Media continuing to upgrade its existing customer base on to higher speed services. Average speeds within the 'up to' 2Mbit/s and 'up to (and including) 10Mbit/s category fell from 5.6Mbit/s to 4.4Mbit/s during the same period (a decrease of 1.2Mbit/s or 21%). Of the different types of broadband technologies, Ofcom's research found that cable broadband connections generated the greatest increases in average speeds in the six months to November 2012 - up by 10.4Mbit/s (58%) to 28.3Mbit/s. Average actual speeds recorded for fibre connections also increased, by 9.4Mbit/s (30%) to 41.0Mbit/s, during the same period. Average speeds for ADSL broadband - a technology that delivers broadband over copper wires - also increased, albeit by just 0.2Mbit/s (3%) to 6.0Mbit/s. Of the 12 ISP packages included in the report, Virgin Media's 'up to' 100Mbit/s service was the fastest, with the research revealing average actual speeds of 92.6Mbit/s over a 24 hour period. Of the other superfast packages included in the research, the average download speed on BT Infinity's 'up to' 76Mbit/s service was 63.3Mbit/s, compared with Virgin Media's 'up to' 60Mbit/s at 59.0Mbit/s. BT's 'up to' 38Mbit/s package achieved speeds of 34.2Mbit/s while Virgin Media's 'up to' 30Mbit/s service had average speeds of 28.7Mbit/s. The report contains new analysis comparing average peak time speeds (weekdays from 8pm to 10pm) with maximum connection speeds (the maximum speed achieved by each connection during the month). Networks can become more congested at peak times resulting in lower speeds. This is known as 'network contention'. 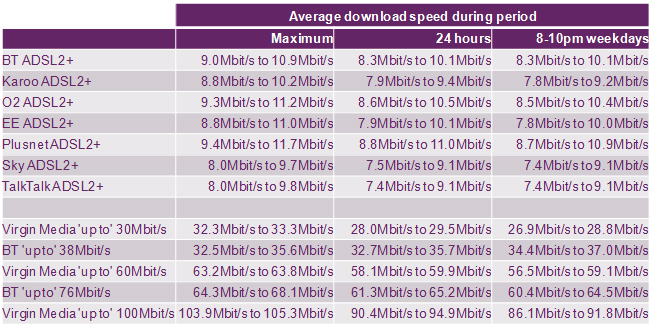 5 The most significant differences in speeds achieved at peak times occurred for superfast packages. In this category, the proportion of panellists who, on average, received more than 90% of their maximum speeds at peak times ranged from 35% for Virgin Media's 'up to' 30Mbit/s service to 91% for BT's 'up to' 38Mbit/s service. The findings suggest that, while there was relatively little congestion in BT's fibre network in November 2012, levels of contention were higher in Virgin Media’s cable network. These ranges reflect the average speeds that would be achieved 95 times out of 100 if the exercise was repeated with 100 sets of different panellists. If the range of two operators overlap, then these operators offer comparable performance. These ranges are not a description of the range of speeds actually measured. Ofcom's research also looks at upload speeds, which are particularly important to those consumers looking to share large files or use real-time video communications. The average actual upload speed of a UK fixed broadband connection was 1.4Mbit/s in November 2012, 0.3Mbit/s (30%) higher than the average recorded in May 2012. The research found that BT Infinity's 'up to' 76Mbit/s service delivered the highest upload speeds of all the packages, averaging 16.1Mbit/s. Among the ADSL2+ packages included in the research, O2's service provided the fastest average upload speeds at 1.0Mbit/s. This is Ofcom's eighth report into fixed-line residential broadband speeds using data collected by research partner SamKnows. The report provides data on the average performance of fixed-line residential broadband in the UK and of the individual ISP packages included in the research. In total, these packages accounted for over 60% of UK residential broadband connections in November 2012. The results help consumers to understand the significant variations in the performance of ISP packages and, when considered alongside other factors such as price, can help them to make more informed purchasing decisions. All of the UK’s largest ISPs are signatories to Ofcom's Voluntary Code of Practice on broadband speeds. Ofcom is conducting mystery shopping research to check ISPs' compliance with the code this year. Ofcom will also be carrying out research to assess the average mobile broadband speeds received by 3G and 4G customers. Ofcom expects to conduct this research around December 2013 and publish the results in spring 2014. The research looked at 12 packages provided by the eight largest ISPs by subscriber numbers. There were 643 million separate test results recorded in 2,019 homes during November 2012. Prior to November/December 2010, speed measurements were carried out using "single-thread" tests, which involve downloading one data file. From November/December 2010 onwards "multi-thread" tests were used to reflect the fact that ADSL2+ technologies were configured to handle multiple users/processes at the same time. However, as ADSL1 technologies provide similar results for both test methodologies and before 2010, most consumers were on ADSL lines, broad comparisons of national average speeds are possible between different time periods. While some consumers are actively choosing to upgrade to superfast broadband packages to achieve higher speeds, many are benefitting from improved speeds as a result of internet service providers’ (ISPs’) network upgrades. In many cases, these upgrades are made at little or no additional cost to the consumer. The main reason for this increase was that the proportion of the connections within this category which were 'up to' 20Mbit/s Virgin Media cable connections increased over the period as a result of Virgin Media's ‘double speed’ upgrades (in November 2012 the average speed of 'up to' 20Mbit/s cable connections was 19.1Mbit/s compared to 6.9Mbit/s for the ADSL2+ connections which make up the majority of the rest of the connections included this category). The fall in the average speed recorded for this category is likely to be for three main reasons. Firstly, Virgin Media's 'double speeds' upgrade programme means that its 'up to' 10Mbit/s cable customers are being upgraded onto 'up to' 20Mbit/s or 30Mbit/s services. 'Up to' 10Mbit/s cable customers typically have much higher average speeds that the ADSL1 connections which make up the majority of the other services included in this category (in November 2012 the average speed of an ‘up to’ 10Mbit/s cable connection was 9.5Mbit/s compared to 3.0Mbit/s for an ADSL1 connection). Therefore a fall in the proportion of these connections that are 'up to' 10Mbit/s cable connections will result in a fall in average actual download speeds. Secondly, as BT's upgrade of its ADSL network to offer ADSL2+ nears completion, the ADSL1 connections which are included in this category are likely to be found in more rural areas, where the average length of the line from the BT local exchange to the end users’ premises is likely to be longer and average speeds therefore lower. Thirdly, the November 2012 figure excludes an uplift which was applied to the May 2012 figures to allow for the fact that average ADSL1 line lengths had increased as a result of ADSL1 users being migrated onto ADSL2+ services. Peak-time speeds and speeds more generally can sometimes also be affected by traffic management policies applied by ISPs. The research was conducted in partnership with broadband monitoring company SamKnows. For more details, visit www.samknows.com. The Communications Act 2003 requires Ofcom to make arrangements to find out about consumers' experiences of electronic communications services, which includes broadband services, and the way they are provided (section 14). We do this by carrying out research into their experiences of these services. Subject to certain exceptions, we have a duty to publish the results of our research and to take account of it in carrying out our functions (section 15).